Don’t Forget Your Favorite Pet This Halloween! Birds are beautiful, geckos are gorgeous, cats are cuddly, cute and quite charming. But for me, there is only one animal that upon sight alone causes me to break into a smile, and that animal is the delightful dog. From the enthusiastic wag of their tails to their wide, happy eyes full of wonder, I think dogs are as close to perfect as living beings get. For starters, they are adorable. And they stay adorable their entire lives, from plush puppyhood to the time their fur turns gray. They are also loyal, compassionate, always up for enjoying the simple pleasures in life, and oh-so-excited to see you. Every. Single. Time. Now, I know there are exceptions to the rule, as there are with all other animals and people as well. But for the most part, in my many years on this planet I have been lucky enough to meet oodles more awesome dogs than grumpy dogs or mean dogs. And one of the things that I find cutest about them is one of the things that is also most annoying: their propensity to beg. Before you go thinking I’m a bad pet parent, please know that whenever I’ve had a dog, I have done my best to train it well and treat it with respect at all times. As much as a dog begging at the table can make for a tricky lunch, it’s also really not fun for the dog, especially if they never get a piece of whatever it is they’re after. But in my experience, even when they have stopped leaping at the table and barking for a bite – even when their training has been as successful as you hoped it would be – if you glance in their direction while you’re eating something tasty, you can see that irrepressible hunger in their eyes. Maybe it’s because I am most often in the company of beagles, and they are notorious food hounds. But whatever it is, that look of longing for a taste tugs at my heartstrings. Certainly if it were me sitting at the foot of the couch and my human was noshing on something nummy, I would want some! Every now and then, I do give my pooch a sampling of my meal when it is dog-appropriate food. I am careful not to feed her when I am eating, or from my plate, instead putting the food in her dish. And on holidays especially, a time for sharing your love with those near and dear, I make a special dish for my dog. Always careful to keep it simple and dog-friendly, I know she enjoys this break from her usual fare as much as I enjoy giving her something really good to eat. For those of you who aren’t ‘dog people’, you might think I’m crazy. But I think the fellow dog lovers out there understand where I’m coming from! One of my favorite holidays is Halloween, and as such I like to go all-out. That said, it’s not your traditional food holiday. I don’t prepare anything extravagant in the way of a meal as I’m usually handing out candy to Trick-or-Treaters or attending a Halloween party. But that doesn’t mean I don’t do anything special for my beagle baby – after all, she would surely win any competition for ‘cutest costume’ before I even put on her Halloween collar! 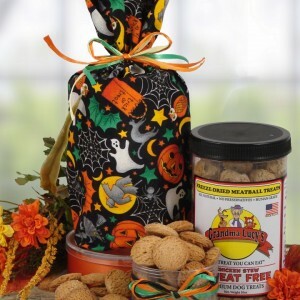 So instead, I’m always sure to bring home some Halloween dog treats from Bisket Baskets. She doesn’t always like when I bring my work home with me, but when it’s Halloween dog treats she doesn’t seem to mind at all! Hasn’t the summer just flown by? Halloween will be here in the blink of a witch’s broom, but we can’t say we mind! Fall is a beautiful time of year, full of unique colors and refreshing Autumn scents. We’ve all filled our treat bags with heaps of candy on Halloween nights over the years, but isn’t it nice once in awhile to change it up and give a gift that has a bit more meaning – and substance – to it? We think so too, and that’s why we’ve dreamed up our Halloween Gift Baskets and Halloween Pet Gift Baskets, along with some additional creative Halloween gift ideas for you and yours! Halloween Earrings: Have a fashionista in your midst? Look for cute Halloween-themed earrings in the shape of pumpkins, ghosts, and spooky cats. Wrap them in orange or black tissue paper, and give this spooktacular unique Halloween gift to your stylish friend or family member! Halloween Crafts: Candy is certainly delicious, but crafts can be used Halloween after Halloween! Do a quick Google search for “Halloween crafts” and look for simple, low-cost Halloween-themed crafts, such as a candy corn wreath. Spend an afternoon crafting, and surprise your friends and family members with cute Halloween craft gifts! 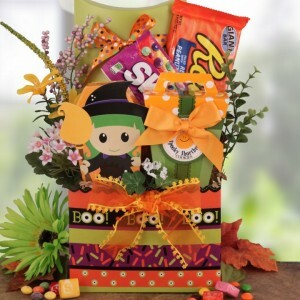 Halloween Gift Baskets: Halloween gift baskets combine the best of both Halloween worlds: candy and gifts! Our Halloween gift baskets are beautifully arranged to delight all the ghouls and ghosts this Halloween, and are filled with delightful treats and Halloween-themed gift boxes and totes. You’ll discover your favorite Halloween candies inside, like Butterfingers, Kit Kats, Snickers, Reese’s, and more! Fido and Miss Kitty can’t exactly enjoy chocolate this Halloween, but they can enjoy the healthy pet treats inside our Halloween pet gift baskets – woof! Orange Cake Pops: Cake Pops are the popular dessert these days, so add a Halloween twist to them to surprise your family and friends with! Search for a recipe online, and make them with orange icing, and roll in Halloween-themed sprinkles. We know they’ll be sinfully delicious! Jack O’ Lanterns: Carving a pumpkin is fun, but oh, does it take work and create a mess! If you have a few hours to spare, get your family together to safely carve a few pumpkins for family members who simply don’t have the time to carve a Jack O’ Lantern or can’t this year, such as elderly grandparents or a new Mom and Dad. Stick a battery operated flameless candle inside, and drop it off to them. They’ll be so happy you took the time to help them share in a Halloween tradition this year! Halloween is one fun holiday, and has only become more popular over recent years. Think outside the treat bag this year and spread the Halloween spirit by gifting your friends and family with eclectic Halloween gifts, from Halloween earrings to Halloween Gift Baskets! Feel free to add in a heaping dash of your own creativity, and start conjuring up your favorite Halloween gifts to give. Halloween is a magical time filled with ghouls and goblins walking hand in hand with princesses and superheroes, and all of us here at BisketBaskets.com love to exude our spooktacular Halloween spirit! We feel Halloween is a holiday that should be shared, and we created our Halloween Gift Baskets so you can send some boo-tiful Halloween wishes across the miles – or the block! Dressing your kids – and your four-legged kids, up for Halloween is an absolute must, and we have some fun homemade Halloween costume ideas for you – Halloween is right around the corner, so start planning! We just know your relatives will want a photo of these costumes, so be sure to send one along with our so cute Halloween Party Gift Basket, too. Fabulous 1950’s Waitress: This is perfect for a little girl. Dress her up in one of her pastel pink, yellow, or blue dresses. Take one of your small white aprons and tie it around her. Have a white cloth napkin? Fold it in a triangular shape and pin it to the front of her hair. Have her wear white socks and saddle shoes, and create a small paper nametag for her. Have her carry a large plastic dish or serving tray! Spa Queen: Isn’t it so relaxing to spend a day at the spa? Dress your little girl up in a white robe and slippers, and paint her nails in a bright shade. Have her wrap her hair up in a white towel and carry a hand mirror. Put light blue facepaint on her face to look like a face mask. Fisherman: This is a fun costume for little boys! Dress him up in a yellow poncho, rain hat, and rain boots. Purchase a plastic fish or make one from felt. Have him carry a tackle box in his other hand. Road Trip: Prefer a more unique costume for your little boy? Take an ordinary pair of sweat pants and a sweatshirt, and stick yellow masking tape throughout it to resemble the lines on a road. Use glue to affix light-weight plastic cars and trucks throughout the “road”. Create highway signs out of thick paper and affix them to the sweats. Life is a highway! Superhero Puppy Power: Does Fido always seem like he has this superdog power to put a smile on your face? Visit your local craft store and pick up material to make a “cape” for Fido. Paint your dog’s first initial on it a la a Superman cape, and tuck it under your dog’s collar to secure it. Fido Goes West: This is a very simple dog Halloween costume – all you need to do is tie a bandana gently around your dog’s neck, and pick up a dog-appropriate cowboy hat at your local pet store. He’ll be hitting the saloon in no time! Pirate Puppy: Like the Superhero costume, make a black cape for your dog and affix it under your dog’s collar. Then, simply visit your local pet or Halloween store to pick up a pirate hat that is dog-friendly, too! Arrrh, matey! Halloween is a memorable holiday – what other day can you dress up like your favorite Superhero, and dress your kids and pets up in so fun costumes, too? Share in the Halloween spirit by sending Halloween Gift Baskets to your friends and family, and be sure to send or email photos of your kids and four-legged kids, too – we know there will be quite the fun photos out there! Happy (early) Halloween! Halloween is everywhere! Eerie Orange lights glowing from housetops and skeletons and coffins are strewn about on people lawns. It’s amazing how people have adopted this holiday and have made it their own. Down the street from us we actually have a neighbor who starts setting up his Halloween display just after Labor Day. There are coffins, skeletons, spiders, giant cobwebs and so much more lurking about his yard. As I sit here at my desk this morning I am reminiscing of years past and my days trick or treating. I’ll admit I did ring a doorbell or two in my day and screamed trick or treat! Where I grew up, flexibility under the Halloween costume really wasn’t an option. You see my sisters and I grew up in upstate New York and it wasn’t always about being cute or scary on Halloween, it was about being warm because almost every year our first snowfall started on no other date but Halloween night! Yeah, Mom dressed us up like the Michelin Man and out the door we rolled! At least 1 pair of long johns, stretchy knit pants, jeans and if we were experiencing a warm Halloween; no snow pants! Our best costumes usually consisted of being a scarecrow or a mummy because it offered us the best opportunity to be toasty warm and still be able to tell what we were! Being from the country, we always headed into town to do our begging for candy and it was always an enjoyable evening out and when we came home we all had toasty hot cocoa and marshmallows waiting for us. At Bisket Baskets, we have really enjoyed this year’s Halloween season. We designed several new Halloween gifts and they have been selling like hotcakes! Looking at all the candy included and having gifts that include everyone’s favorite candy like Reese’s and M&M’s it’s no wonder. I’ve actually been thinking of staying home this Halloween and let my Granddaughter and her Mom just go out. I’d be willing to stay warm at home pass out the candy at our house and enjoy a Halloween Gift Basket just for me instead! Now that all those candy filled pillow sacks are about to be arriving home filled with suckers, candy bars, apples and more, we want to be sure you all remember that chocolate is dangerous for dogs! 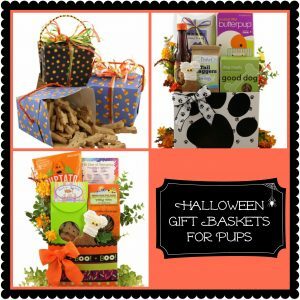 So if you want to spoil Fido this Halloween, Bisket Baskets offers safe pet treats – check them out at our Halloween Pet Gift Baskets page. So please remember to sort your candy safely and stash the really good stuff with chocolate up high so Fido won’t get into it. 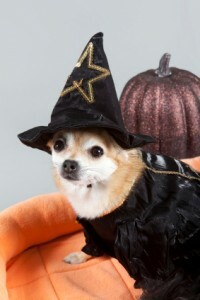 If you haven’t read the “Five Ways to Keep Your Pet Safe on Halloween Day, by Paul Mann” it’s not too late. Check it out at the All Dog Blog. Send a fun Halloween Gift! Just over two weeks from now the streets will be lined with munchkins all decked out in their favorite costumes. Just a short walk down the block will put you face to face with some pretty scary witches, ghosts, goblins and even a few Dracula’s! The best part of Trick or Treating as I remembered it was getting back home and empting the pillow sack on the living room floor and digging out all those Reese’s Peanut Butter Cups! I’d take bubblegum and other goodies and try and trade with my sisters to get even more Reese’s! Things just don’t change too much when you have a hit on your hands and our Halloween Reese’s gifts are disappearing in front of our very eyes. It seems that kids of every age will be receiving Halloween gifts this year. 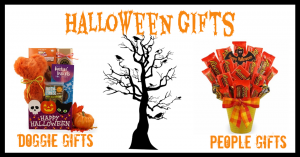 So don’t miss out on some fantastic Halloween gifting, check out our Halloween gifts for friends and family and we even have Halloween pet gifts for our brave four-legged friends as well! In case you were still wondering about how I made out with that trade of bubblegum for Reese’s? I didn’t! 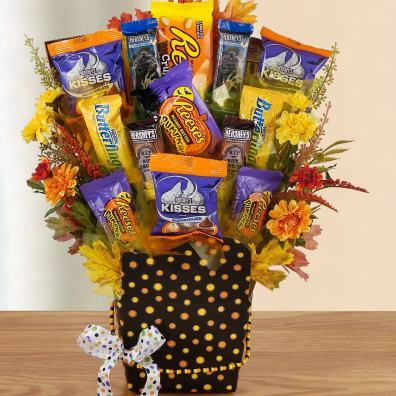 So this year I’m sending myself my very own Boo-tastic Candy Bouquet loaded with all my favorites, Reese’s, Hershey Kisses, Butterfingers, and more!